Standing planters can be set up on any flat surface. Standing planters are basically planter boxes with legs that raise your garden to a comfortable working height, so you can enjoy flowers, herbs and vegetables conveniently close to home and without the strain of bending over. Raised standing planters can be set up on any flat surface, such as a deck or patio, for an easy and accessible kitchen garden right outside your door. They look great paired with matching garden trellises to bring flowering vines and climbing plants up to eye-level. Standing planters have plastic liners to collect water draining out from the bottom of the planter and channel it to one side, keeping the area below and optional shelf dry. Our standing planter kits are a popular choice for school and community garden projects, allowing anyone to enjoy gardening, regardless of age or ability. Standing planters are also ideal for gardens at retirement communities. They can be set up almost anywhere—along walkways, balconies and courtyards—to create accessible raised gardens in easy to access locations. Easy assembly—stack boards and insert corner pins. Attach legs and bottom with included screws. Build accessible raised gardens right outside your door! Width - All standing planters are about 2 feet wide, which provides a good balance of soil capacity, weight and accessibility. Length - Standing planters are available from 2 to 6 feet long. Short planters require less floor space, to fit on a small balcony or porch. Longer planters provide more growing space and greater soil capacity per dollar. Height - Standing planters come in two heights, 23 and 34 inches. Planters 34 inches tall will let you garden while standing up, without the need for bending over. Either height offers wheelchair access. Custom planter heights are also available. Please contact us for more information. Depth - Standing planters come in soil depths ranging from 5.5 to 16.5 inches. Standing planters 11 inches deep are popular and versatile enough to grow most vegetables. Planters 16.5 inches deep provide more soil capacity for deep rooted plants, such as tomatoes, while 5.5 soil depths can be used to grow salad greens and short season herbs and flowers. Shelf - Standing planters can be equipped with an optional shelf, to keep tools and amendments handy. The shelf option is only available for standing planters 34 inches tall and 5.5 to 11 inches deep. All of our planters are made from durable cedar protected by a non-toxic waterproof sealant that is safe for vegetable gardening. 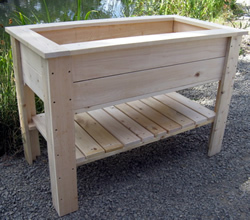 In addition to the sizes above, custom standing planters are also available. If you don’t see what you’re looking for, just ask. We'll help you build the perfect garden. Trellises are available for any size planter! See prices and sizes. Standing planters can be set up on any ground surface that is reasonably flat and level, such as a deck or patio, rooftop, driveway or parking lot, as well as dirt and lawn. The planter’s slatted cedar bottom provides excellent drainage on non-absorbent surfaces such as compacted dirt and concrete. Raised standing planters can be built up to six feet long, and in two heights, 24 and 34 inches. An optional shelf keeps tools and amendments handy. Follow these simple instructions to assemble the planter. It’s recommended to add 1-2 inches of gravel to the bottom of the planter to help prevent soil from washing out over time, and to improve drainage and aeration. You can find more tips on container gardening in our gardening help section, or let us know your specific needs for free garden planning and advice. 10 year warranty Standing planters are covered by a 10 year limited warranty. "What a great item. So easy to assemble and a real quality product."